CAD / Welcome To Grey Edge – A little About Us ! Home » Blog » Welcome To Grey Edge – A little About Us ! 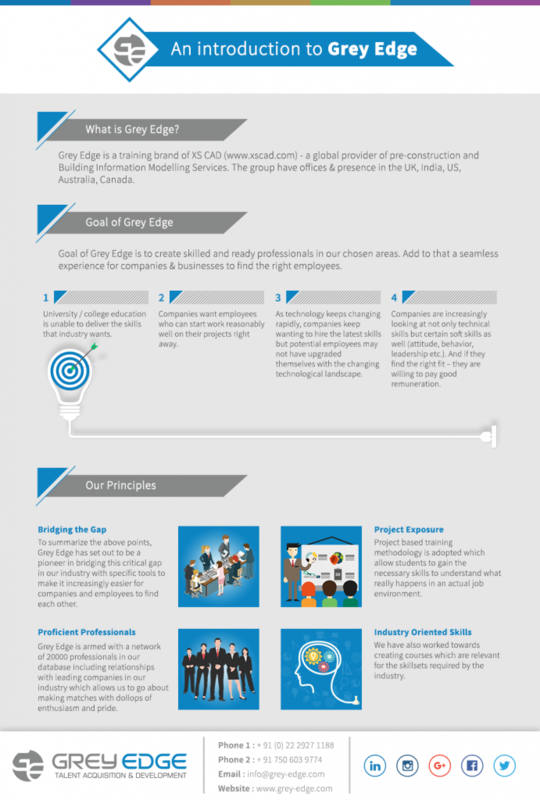 Welcome To Grey Edge – A little About Us ! Thank you for visiting our website. Grey Edge is a training brand of XS CAD – a global provider of pre-construction and Building Information Modelling Services. The group have offices & presence in the UK, India, US, Australia, Canada. “Training brand” is actually a bit of a misnomer. The goal of Grey Edge is more elaborate. Our wish is to train and therefore create skilled and ready professionals in our chosen areas. Not only that, we wish to provide a seamless experience for companies & businesses to find the right employees in these areas. While the above sounds like a pretty simple and an obvious goal it really is not that simple we feel. India (or shall we say the world ?) faces some major challenges on this front. While companies have expansion plans and the Indian economy is expected to grow significantly for the foreseeable future – companies have been really complaining about not being able to find the right employees to manage their projects / growth. This despite Indian Universities churning out record number of graduates. Conversely – many of the employees / graduates / professionals complain about a lack of good opportunities and well paying jobs. So where is the issue ? University / college education is unable to deliver the skills that industry wants. Companies want employees who can reasonably start working on their projects right away. As technology keeps changing rapidly, companies keep wanting to hire the latest skills but potential employees may not have upgraded themselves with the changing technological landscape. Companies are increasingly looking at not only technical skills but certain soft skills as well (attitude, behaviour, leadership etc.). And if they find the right fit – they are willing to pay good remuneration. Thus there is a gap between a potential employee and an employer. It is important to be able to understand this gap and what is required to fill it. Grey Edge has, through more than 14 years of experience of it’s parent, worked hard in identifying and understanding this gap with a lot of detail. We can safely claim that in the areas of our operation – we really understand what this gap very very well. And therefore – our goal can now be defined us – Grey Edge wishes to help bridge this gap. The gap between education and a career. We have worked towards creating courses which are relevant for the above skillsets and which are required by the industry. We follow a unique project based training methodology which allow students to gain the necessary skills to understand what really happens in an actual job environment. We do not train for the sake of explaining a few commands. No. In fact our team comprises of Training Experts who are an integral part of our company. They enjoy their work and have built their own careers in delivering high quality training. They intricately understand the needs of their students well. They are closely involved in creating our successful training programs and hence know very well how to deliver the same. Finally – our recruitment & placement team. Armed with a network of 20000 professionals in our database and a relationships with leading companies in our industry – they go about making matches with dollops of enthusiasm and pride. In fact – in their success lies the success of our entire goal. Thus – Grey Edge has set out to be a pioneer in bridging this critical gap in our industry with specific tools to make it increasingly easier for companies and employees to find each other. You are welcome to join us in this journey !